The CUP Series, produced and managed by Championship Golf Tours & Events, will launch on September 6, 2017, "The Carrabba Cup." 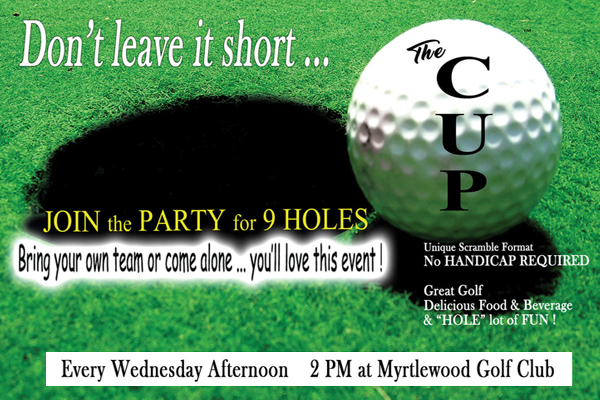 The GOLF SOCIAL EVENT will be played this Fall at The Founders Club and Myrtlewood Golf Course in Myrtle Beach. The event is scheduled to be offered every Wednesday afternoon (weather permitting). The CUP friendly foursome format does not require a handicap. All players will have a fair chance to end up in the winner's circle using a unique point scoring format for individuals and team accomplishments. Foursomes will be formed for players not booking a foursome. Getaway golf groups don't need to worry about disrupting their custom package. The event can be substituted or added as an additional option. Although the event is a 9 hole event, a 18 hole option is available based on availability. The weekly CUP event is designed to appeal to golfers, groups and residents looking for an afternoon round and golf social that includes all the ingredients...competition, play on award-winning course, fun, excitement and a reasonable price. Of course a perfect recipe would include prizes, gifts, range balls, and delicious food. The CUP leaves no stone unturned. The CUP "perfect recipe" provides all the ingredients mentioned including a CARRABBA's Italian Grill Chicken Marsala with Penne Pomodoro dinner following the round. What a way to end the day!